Docking is a village in the northwest corner of Norfolk, close to many coastal resorts such as Hunstanton, Heacham and Brancaster. Docking can trace its history back to Roman times, and is mentioned in the Domesday Book - the name spelled variously as DOCHINGA, DOCHINGE, DOCKINGE and DOCKINHE. Today, Docking remains an active working village with a pub, fish & chip shop, grocery store and Post Office, and even a blacksmiths. Parts of Docking Village Hall date back almost 150 years, with the flint section originally built in 1869 as a Working Man's Institute, the reading room supplied with daily and weekly papers and periodicals. The main part of the hall was built in the 1920s and, as well as accommodating the more normal activities, during the Second World War it became variously a cinema, place of refuge and a doctor's surgery, the latter use continuing until the late 1970s. In 1967 Mrs Nancy Ripper purchased the hall for the sum of £3000, dedicated it to her late husband Dr W E Ripper, a farmer and landowner in Docking who was a world renowned agricultural scientist, and gave it to the village - and thus the "official" name of the village hall is Dr. W.E. Ripper Memorial Hall, known in the village as simply "Ripper Hall". Today, Docking Village Hall is at the heart of many of our local activities and is the location of the weekly Docking Market, featuring fresh local produce and a wide range of locally-made products. Please follow the link to the Events section of the website to see a schedule of the forthcoming events at the hall. We have many local clubs and societies who use the hall - follow the Clubs link to find out more about them, as well as other local groups and individuals who hire the hall for their own functions. Please follow the main menu above, the quick link to the right or click on this link to find out how to book the hall. For further information on the facilities and layout of the hall, and the various rooms available for hire, please follow the main menu above or click on the quick link to the right. To contact us (other than for bookings) or for any further information on Docking Village Hall, please call Matthew Todd on 07483 233553 or e-mail us. Half a century of exposure to the bracing north Norfolk elements means that the old concrete tile roof of the hall now needs to be replaced. Please follow this link to see how you can support this endeavour and secure your place for posterity with our 'Sponsor A Tile' programme. 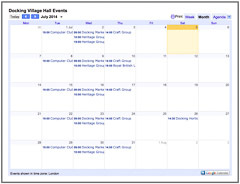 Docking Village Hall (DVH) provides the www.dockingvillagehall.com website as a service to the public. The information contained in this website is for general information purposes only. DVH is not responsible for, and expressly disclaims all liability for, damages of any kind arising out of use, reference to, or reliance on any information contained within the website. In no event will DVH be liable for any loss or damage whatsoever arising from, or in connection with, the use of this website. Although the DVH website may include links to other Internet resources, including third party websites, DVH is not responsible for the accuracy of content or information contained in those websites. Links from the DVH website to third party websites does not constitute an endorsement by DVH of the parties or their products and services. Every effort is made to keep the DVH website up and running smoothly. However, DVH takes no responsibility for, and will not be liable for, the website being temporarily unavailable due to technical issues beyond our control.